This is a new business which opened at the end of May. 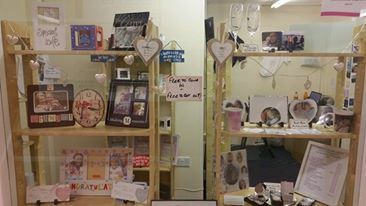 A friendly, family run business offering a wonderful selection of personal gifts and so much more. Call in to have a look at what Gift & Photo Cabin can do for you and make that special occasion extra special to your loved ones. Your Photos and messages printed on: Mugs, photo slates, glass photo frames, coasters, magnets, keyrings, mouse mats, jigsaws, compact mirrors and much more. Gifts for: Baby, Son, Daughter, Grandma, Mum etc. Hen/Stag Party/Workwear etc: Enquiries welcome for t-shirts printing. Plaques personalised with your messages or names/ Glass etching.